Big Tee Shirt - Our favourite 'cheap and cheerful' UK outsize retailer is run by outsize people for outsize people. Big Tee Shirt supplies inexpensive underwear for the bigger person in the UK , to size 8xl (66" boxers, briefs & vests) and up to 13xl (92" chest) in polo shirts. Chums is a niche direct mail order company that supplies, direct to the public, ranges of traditional clothing and other products for men aged 55 years or over. Chums has'hard to find' high waisted underwear and stock large waist sizes up to 54" boxers and 58" vests. Thermals too. All at bargain prices. La Redoute (uk), France's #1 online clothing retailer, have lots of men's underwear in 4xl, up to 55" waist and 58" chest. 48" Swimming trunks too. 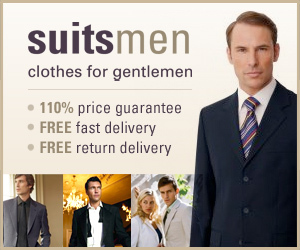 SuitsMen have been retailing on the net for 5 years. Wolsey underwear to 44" waist. The price shown is what you pay. No 'Post & Packing' costs in the UK. and no hidden extras. TESCO carries a small range of mens underwear staples, at their usual low prices. Sizes up to 3xl for briefs and vests. Delivery £3.95 regardless of order size. Burton has underwear in XXXL, but don't stock above this. They supply briefs up to 68" waist and have size 4xl vests. Supersize boxer shorts in sizes 8XL 9XL and 10XL. These will fit men weighing up to 40 stone.